El Capitan is the biggest exposed granite monolith in the world. The Nose of El Capitan was first climbed in 1958 by Warren Harding, Wayne Merry, and George Whitmore. The climb took them 47 days to complete. El Capitan is three times higher than the Empire State Building. The rock is likely to stand for thousands of years to come; though there is internal pressure that is slowly pushing a large granite block off the main rock cliff, there are no cracks in the rock face to expose it to erosion. El Capitan, also known by its nickname El Cap, is one of the most recognizable granite rock formations at Yosemite National Park. Like its neighbor Half Dome, El Capitan is clearly visible and accessible from the floor of Yosemite Valley, and its image has become synonymous with this California park. The enormous rock, whose name appropriately means “the captain” or “the chief,” towers 3,593 feet above the floor of the valley and its distinctive granite cliff face is a popular—and challenging—destination for rock climbers. Formed by glacial erosion, El Capitan, like most of the rock formations in Yosemite, is formed primarily of the eponymous El Capitan granite, with veins of volcanic rock. It is the largest granite monolith in the world, being made of one solid chunk of granite. El Capitan has two rock faces that are popular with climbers, one facing to the southeast and one facing to the southwest. Between them is a ridge of granite that has been named The Nose, which is the most famous route up to the top of the cliff. Located on the north side of Yosemite Valley, some of the best views of the towering monolith are actually from roads on the valley floor, including the area around Bridalveil Falls, which is directly opposite El Capitan. There are many hiking trails that allow you to view or to access El Capitan. To get to the summit of El Capitan, take the Yosemite Falls Trail, but continue past the Upper Falls to hike up the trail to El Capitan. You can also get an excellent view of El Capitan as well as the rest of the rock formations lining Yosemite Valley by going up to Glacier Point, which is possibly the best viewpoint in the park. Glacier Point is easily reached by driving along Wawona Road and turning on to Glacier Park Road. 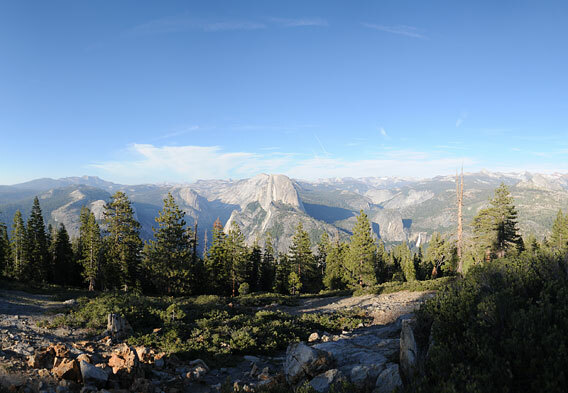 After parking, continue for a short walk up Glacier Point Trail to get to the viewpoint. 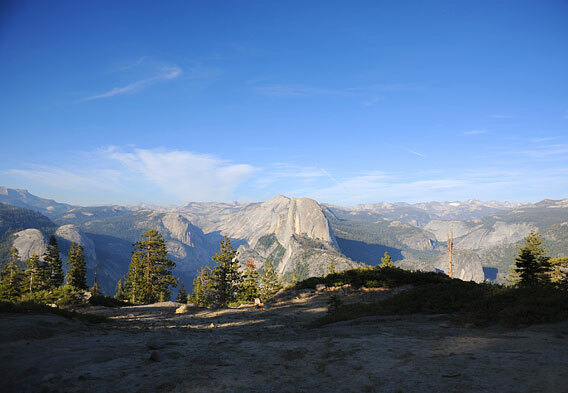 If you’re in a mood for a challenge, you can climb to Glacier Point via the Four Mile Trail, which climbs 3,200 feet from the valley floor to Glacier Point, or the longer Panorama Trail. Taft Point can be accessed from Glacier Point Road, just before you get to the turnoff for Glacier Point. This viewpoint, though easier to reach, should not be disregarded as it also provides excellent panoramic views of Yosemite National Park. Like Glacier Point, Taft Point offers a wide view of the entire valley, including stunning views of El Capitan and Yosemite Falls. From the parking lot it is an easy downhill trail, about 20 to 30 minutes’ walk, to Taft Point. The spectacular Yosemite Falls are located in close proximity to El Capitan. It is the highest waterfall in North America, and is a spectacular sight, especially in the spring when the spring runoff swells the volume of water plummeting over the falls. It begins at the 1,430-foot Upper Falls, continues down the Middle Cascades, and drops again over the 320-foot Lower Falls. 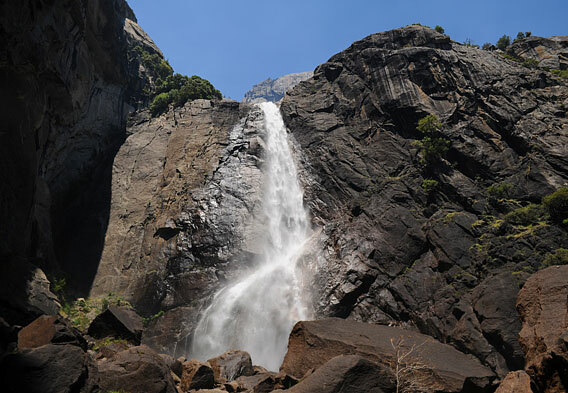 The Yosemite Falls Trail is one of the most popular trails in the park, and is well worth the somewhat strenuous hike. If you want to challenge yourself further, you can continue on this trail up to the peak of El Capitan.